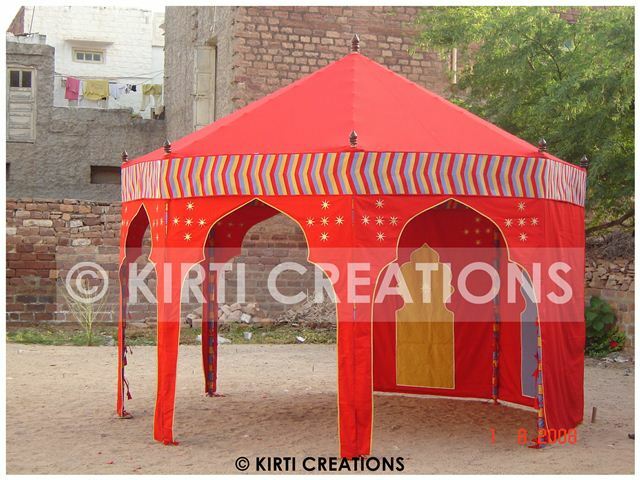 Indian Tent serve exotic and superb design which use each kinds of occasion, it is made pure cotton fabrics. It is available in wide range of pattern and design. You can hire this tent at budget price, if you make party memorable so should be hire this tent. Durable Party Tent:- Durable Party Tent is design red color of fabrics and small in sizes. Simple in look but have appealing quality and the main thing is it is fabricated with durable canvas. It is use in all kinds of weather like rainy or winter. It is ideal for small sizes of party. Indian tent manufacturer is export quality of tents. Indian Tent is fabricated with the help of expert members. Our all products totally based on traditional and classic look. We offer Indian Tent in very low costs whatever it has very magnificent look. Handmade Tents is assembled using best quality of marquees.